Nepal is undoubtedly one of the best places in the world for rafting and kayaking. Because not only does it have a plethora of rivers that spoil you for choice, it also combines ideal river conditions, white sand beaches, spectacular scenery and a rich and exotic culture. The rivers of Nepal take you away from busy trekking routes to the heart of rural, roadless, unspoilt Nepal. 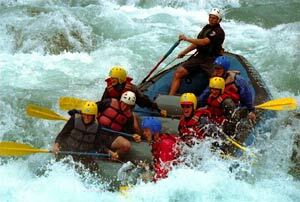 Rafting is an attractive alternative to trekking. At the same time it complements trekking. Rafting has minimal ecological effect, causing little or no disruption to the social patterns of local life. You can enjoy peaceful river travel, or the adrenaline-pumping thrill of running white water. Drifting along in a boat is the most idyllic way of viewing wildlife. The ideal time for rafting is September to early December and March to early June. The rivers are best avoided in the rainy season, as the high flow makes it potentially dangerous. Factors to keep in mind. To decide on a river trip keep in mind the style of the trip, the level of difficulty of the river and the time factor. Your raft could be rigged with an oar frame where the guide sits in the middle and rows, while the passengers don't have much to do other than enjoy the scenery. The other option is the paddle raft. Here the guide usually sits at the back shouting instructions and steering the raft, even as the entire crew participates to provide the power. Paddle rafting provides a wonderful experience of team working. Worldwide, rivers are graded into 6 classes on their increasing difficulty. Class 1 : Easy - Moving water with occasional small rapids. Few or no obstacles. Class 2 : Moderate - Small rapids with regular waves. Some manoeuvring required, but easy to navigate. Class 3 : Difficult - Rapids with irregular waves and hazards. Monoeuvring slightly more difficult but routes are obvious. Occasional scouting from the shore necessary. Class 4 : Very difficult - Large rapids that require careful manoeuvring. Scouting from the shore often necessary. Turbulent water and large irregular waves makes rescue difficult. Class 5 : Extremely difficult - Long and very violent rapids with continuous, powerful current. Scouting from shore essential. Rescue is very difficult to impossible. In the event of a mishap there is a significant danger to life. Class 6 : Nearly impossible - Difficulties of class 5 carried to the extremes of navigability. Attempted only by experts. The Rafting Bible - Get your hands on the 'White Water Nepal' by Peter Knowles and David Alardice. This book will give you all the information you need on white water rafting in Nepal. Gearing Up - You can get your own gear to Nepal without any hassle. Or you can get good enough gear from the organisers of rafting in Nepal itself. Permits - Before going rafting or kayaking you will need a permit which is obtainable from the Ministry of Tourism, Tripureshwar Marg, Kathmandu. Also, rafting is not permitted in all the rivers. So check it out. Safety in Numbers: The recommended minimum is two rafts per trip. In higher water, three rafts are safer than two. These days one or two safety kayakers replace the second raft. This is considered a better option. Always wear a lifejacket on the rapids. Make sure that it is properly fitted. Wear your helmet whenever your guide tells you. Keep your feet and arms inside the raft to save yourself from any injury lest the raft hits a rock or wall.. If you happen to fall off the raft, get into the white water swimming position which is on your back and with your feet downstream. This enables you to see where you are going. Hold onto your paddle as this makes you more visible. Try to relax, and breathe when you aren�t going through waves. Turn over and swim at the end of the rapid when the water becomes calmer. Do you need to know swimming? Though deemed risky, river rafting is one of the least hazardous activities. And though it is not necessary to know swimming, a swimmer tends to feel much more confident than a non-swimmer. These save you the hassle of obtaining permits, as your trip organiser will organise it for you. Also everything from gear to food will be taken care of, and all you'll need to get is the clothing. A lot of professional companies in Kathmandu organise river trips with adequate safety measures. You have the option of choosing from rafting and kayaking trips too. For a duration of 7 days or more, the following rivers give you the most thrilling white water experience. The Sun Kosi starts close to Kathmandu, making it the cheapest and the most popular. You can drive down to the starting point. 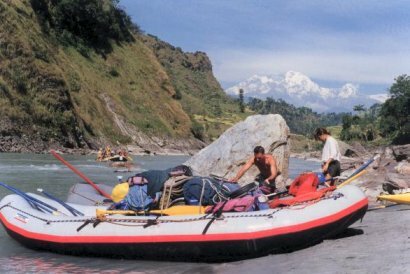 Often described as one of the ten best rafting trips in the world, its an ideal choice for most people, especially first time rafters in Nepal. The Karnali makes for the best overall trip. The rapids are more challenging but not overtly difficult, than the Sun Kosi. Besides it also includes a two-day trek, superb canyons, pristine wilderness, and can be topped off with a couple of days at the Royal Bardia Wildlife Reserve! The Tamur is a mini Karnali. You have to trek to reach the starting point, and at the right water level, the rapids are more challenging than the above two rivers. The Kali Gandaki's full length makes for a wonderful trip, especially when combined with a trek in the Annapurna area. Trisuli is a cost-effective option, provided you remain unaffected by the main highway that runs alongside most of it's length. The Upper Kali Gandaki is a more exciting and scenic option. The Lower Kali Gandaki is easier waters, and offers beautiful scenery, jungle, wildlife and unspoilt white beaches. The Lower Bheri (from Surikhet) is expensive but offers superb wildlife, pristine scenery and easy rafting. The Trisuli offers a day or two of exhilarating white water without burning a hole in your pocket. A reason for it's unprecedented popularity. The Upper Sun Kosi gives a day of easy water rafting through unspoilt territory. The Bhote Kosi with it's 16kms stretch offers one of the most challenging short rafting trips in Nepal, but is recommended only for the experienced crews. 1-3 days white water trips ... Trisuli, Bhote Kosi, lower Tamur. The longest river trip in Nepal and counted amongst the 10 best river trips in the world, this trip starts at Dolaghat, two hours out of Kathmandu. The trip begins barely 60kms from the Tibetan border, and takes you down to the hot, dusty, northern Indian plains. Since most of the rapids of Sun Kosi are formed by monsoon debris brought by side streams and loose rock-fall, the rapids change every year. The first couple of days are warm-ups with easy class 2 and 3 rapids. This prepares you for the bigger, powerful rapids that you will navigate in the last few days. The last stretch is a peaceful cruise down the Sapta Kosi, Nepal's biggest river. At the end, you can either proceed straight back to Kathmandu or drop by at the Koshi Tappu Wildlife Sanctuary or the Royal Chittawan Park. The Sun Kosi trip is a magical combination of white water, scenery, villages and quiet and introspective evenings. Hardly surprising then, that it is one of the favourites. If you are interested in rafting or kayaking and you would like me to obtain quote(s) for you from reputable operator(s), then please email me here with any dates you had in mind.